Mines often prefer reinforced soil structures over traditional reinforced concrete structures due to the economic benefits both in cost, time and safety. A possible solution for this kind of wall is to utilize Terramesh System in combination with high strength geogrids. Maccaferri renowned Terramesh System is a modular system used to form rock faced reinforced soil walls (also known as Mechanically Stabilised Earth) and embankments. It has been used globally on some of the most significant infrastructure schemes, including what is believed to be the tallest reinforced soil structure in the world at 74m high. 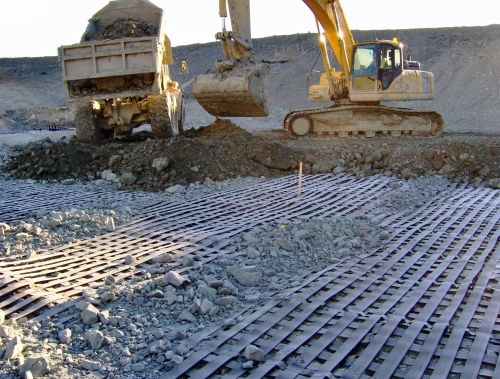 On taller slopes and structures, it can also be used in conjunction with our high-performance primary geogrids, ParaLink geogrids, ParaGrid and MacGrid WG. It consists of pre-assembled units of double twisted wire mesh (8×10 type). The facing section of the unit is formed by connecting a back panel and diaphragms to the main fascia unit, thus creating the rectangular shaped cells used for stone confinement. The geogrid reinforcement, fascia and lid are all one continuous panel of mesh. Terramesh System units are supplied in standard lengths, requiring no cuts on site. The following assembly on site, the fascia unit is filled with suitable gabion stone fill. Structural backfill is then placed upon the soil reinforcement geogrids and compacted. Subsequent Terramesh layers are placed onto the completed layer beneath.